Authors: V.B. Borodulin, P.V. Glybochko, A.F. Yurtaeva et al. Action of preparations is investigated: 2-benzoil-3,5-biphenil-selenophen(compaundl), l,5-bi-(2,4-bioxyphenil)-3-selenopentan(compaund2) and l,5-bi-(n-chlorphenil)-3-selenopentan-l,5(eompaund3) on microorganisms allocated from urological patients. Suppression of bacterial growth is revealed. At action by the given preparations on Escherichia coli it is revealed, that the preparation compaund3 considerably suppresses growth of microbic cells Escherichia coli in comparison with preparations of the compaundl and compaund2. At action on Klebsiella oxytoca, it is revealed, that the given preparations intensively slow down, growth of microbic cells, and linear dependence on a doze of preparations is observed. All articles of the authors: Glybochko P.V., Borodulin V.В. Authors: A.M. Belov, V.B. Borodulin, P.V. Glybochko et al. It has been studied of an alloy nanobody of copper, zinc and iron on E. coli and Ps. aeruginosa, allocated from sicks by urological diseases. The number of colonies of the microorganisms which have been grown on cups with various concentration nanobody of metals in suspension, and change of parameters of biochemical activity of bacteria was considered. The expressed antibacterial action investigated nanobody on E.coli and Ps. aeruginosa has been as a result revealed. In article possible metabolic ways of formation kidney stones of various structure on the uniform biochemical mechanism are considered. Authors offer pathogenetic model of stones bilding in kidneys and consider experimental approaches for the proof of the offered theory. All articles of the authors: Borodulin V.В., Glybochko P.V. The purpose of research. An estimation of a functional condition of uric ways at the fetal with the pyeloectasia and development on their basis prognostic criteria. Estimated the urodinamical parameters of the top and bottom uric ways in the period of intra-uterine development at 105 fetal with the pyeloectasia in terms gestation 20-40 weeks by prenatal the ultrasonic cistometrii process of filling and evacuation of the urinary bladder. The bladder - independent pyeloectasia in 74,5 % of supervision existence with of the normal function of the urinary bladder of the fetal, in 40,4 % of cases spontaneously disappeared in the third trimester of pregnancy and had in all supervision a favorable outcome for the newborn. The bladder - dependent forms of the pyeloectasia in 76,8 % arose on a background of infringement urodinamical the bottom uric ways, were spontaneously resolved in the prenatal period in 12,5 % of supervision. The postnatal during is characterized by high frequency of occurrence of microbno-inflammatory diseases of bodies мочевыделительной systems (26,8 %), disorder of the urinary bladder frustration (26,8 %) and the bladder -ureter refluxes (21,4 %). The pyeloectasia of the prenatal period of development occurrences described by various terms and features prenatal currents and postnatal the forecast are presented by the diverse groups depending on function of a urinary bladder. All articles of the authors: Chekhonatskaya M.L., Glybochko P.V. Analysis of results of treatment of 102 patients, taking place to clinic concerning a renovascular hypertension carried out. Modern methods of diagnostics , and also the operative treatment by the patient with renovascular the hypertensions, caused both second, and bilateral stenoses renal arterias are described. The substantiation is given to a choice of various kinds of operative treatment at the given category of patients. All articles of the authors: Glybochko P.V. Authors: Skripkin Yu.K., Dvornikov A.D., Skripkina P.A. Infection of genito-urinary tract, caused by C. trachomatis are common worldwide and especially among childbearing age individuals. This infection is the most prevalent sexually transmitted bacterial infection and can cause considerable reproductive morbidity in women. The peculiarity of this infection to others is asymptomatic course and inclination to chronic inflammation and fibrotic disease of the urogenital tract. Based on a contemporary literature review, research work and own experience, the authors present data on the epidemiology, clinical picture and treatment of Chlamydia trachomatis urogenital infecnions. All articles of the authors: Skripkin Yu.K. The purpose of the research was the study of cellular immune status and serum cytokines at pregnant patients with pyelonephritis. We have studied 106 pregnant with purulent pyelonephritis. 50 patients with serous pyelonephritis s and 30 healthy pregnant were the group of control. Clinical, microbiological and immunological methods of research have been used. Distinctions in parameters of cellular immune status and serum level of interleukin-1-betta, interleukin-8, interleukin-4, interleukin-10 and interferon-gamma at pregnant patients with serous and purulent pyelonephritis were determined. Deep depression of cellular immunity , the increase of serum concentration of interleukin-1b, interleukin-8, interleukin-4, interleukin-10 and lower contents of interferon-gamma were registered at pregnant patients with purulent pyelonephritis. Most radical immune changes at patients with apostems and renal abscess were registered. Criteria of early diagnostics of a bacterial shock by pyelonephritis in pregnancy are offered. 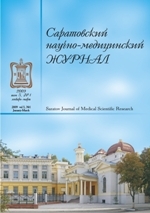 All articles of the authors: Glybochko P.V., Chekhonatskaya M.L. Analysis of results of treatment of 260 patients, was operated concerning hormonal awake tumors of adrenals is carried out. Long-term results of operative treatment of the given pathology are tracked. Bunches of patients with an arterial hypertension of an adrenal genesis to with operative treatment is shown are secured. All articles of the authors: Glybochko P.V., Svistunov A.A.